A Nissan Leaf electric vehicle charges at a station in Balboa Park, San Diego, November 2015. A clean transportation system hinges on plug-in electric vehicles and the policies that work to deploy them. Although the electric vehicle market is growing, it comprises a small percentage of cars on the road. Issues such as initial cost, range, model availability, knowledge gaps, and the availability of charging infrastructure continue to inhibit vehicle deployment. Government has a strong interest to support the developing electric vehicle market and promote innovation in this sector. Yet progressive leaders who want to incentivize sector growth may not be aware of the existing policy options and, more importantly, of those policies’ effectiveness in actual electric vehicle deployment. This report assesses policies that could be effective at increasing the share of light-duty plug-in electric vehicles (PEVs)—small vehicles that can be plugged in to a power source. First, it surveys national-level policies in the United States, Norway, and China. Then, it conducts a quantitative analysis of what policies have worked at the state level in the United States. The report focuses on policies targeted at vehicles rather than charging infrastructure. Although many states have additional policies specific to charging infrastructure, in the analysis, these were not considered in depth due to the added scope and complexity of the issues. There is great anticipation regarding the role of forthcoming funds available to states through the Volkswagen Mitigation Trust (see text box below), which can complement existing state polices and help to build out charging infrastructure. Since a retrospective review is not yet possible, and the funds are available primarily for charging infrastructure, they also are not considered here. Volkswagen agreed to settlements to resolve the federal government’s allegations that the company cheated emissions standards.7 Of the settlement funds, $2.7 billion will be used to establish an Environmental Mitigation Trust. Over the next 10 years, states and territories may use the funding available to them in this fund to invest in specific transportation projects that are proven to reduce nitrogen oxide (NOx) emissions. States may allocate up to 15 percent of their funds to build electric vehicle charging infrastructure.8 Outside of the Mitigation Trust, Volkswagen will also invest $2 billion in charging infrastructure and in the promotion of zero-emission vehicles—such as battery electric vehicles, plug-in hybrid electric vehicles, and fuel cell electric vehicles. Excluding California, the zero-emission vehicle mandate is the best predictor of states with high plug-in electric vehicle market shares. Financial incentives for vehicles, such as rebates and tax credits, are very effective. Free high-occupancy vehicle (HOV) lane access is useful—but less so outside of California. On average, state government fleet acquisition requirements are poor predictors of government fleet market share; however, in some cases they have proven effective. Eliminating emissions testing fees or licensing fees does little to increase sales. Policies that are aimed at raising revenue for infrastructure by increasing licensing fees do so without inhibiting market growth. As states take on an increased leadership role promoting electric vehicles, they should consider what policies put more of these vehicles on their roads. “Electric vehicles” is a broad category that can mean different things in different situations. To avoid confusion, this report generally avoids using the term “electric vehicle.” When the term is used, it is intended to represent all vehicles that can run on some form of electric power. 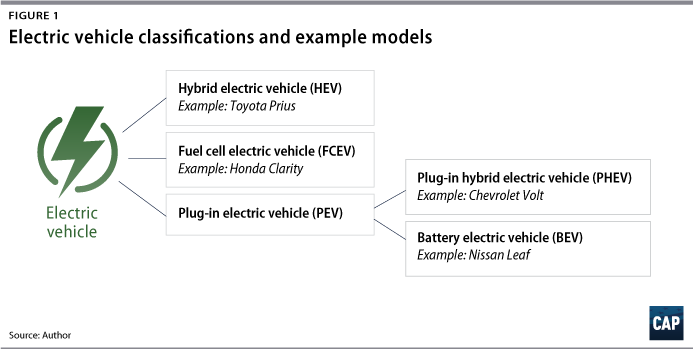 Figure 1 shows the different types of electric vehicles and some example models. The first commercial electric vehicle hit U.S. streets in 1897, and, in the early 1900s, electric vehicles made up one-third of all vehicle sales.9 Concerns about battery range, coupled with the cheap availability of gasoline, led the ICE vehicle to dominate the market throughout the 20th century. However, electric vehicles could once again become the vehicles of choice in the United States. PEVs can be connected to the electricity grid and recharged through charging infrastructure—sometimes referred to as electric vehicle supply equipment (EVSE). The types or levels of charging infrastructure are commonly defined as Level 1, Level 2, and direct current (DC) fast chargers. As battery technology improves, vehicles will be able to go farther on a single charge. Large-scale PEV deployment is necessary to achieve significant carbon emissions reductions in the United States. 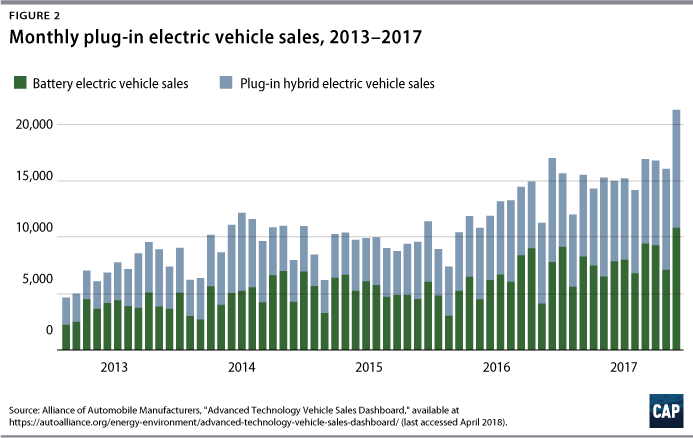 Yet, despite a variety of national and subnational goals and commitments related to electric vehicle deployment, market growth has been slow. Outside of California, PEV sales vary widely by state. 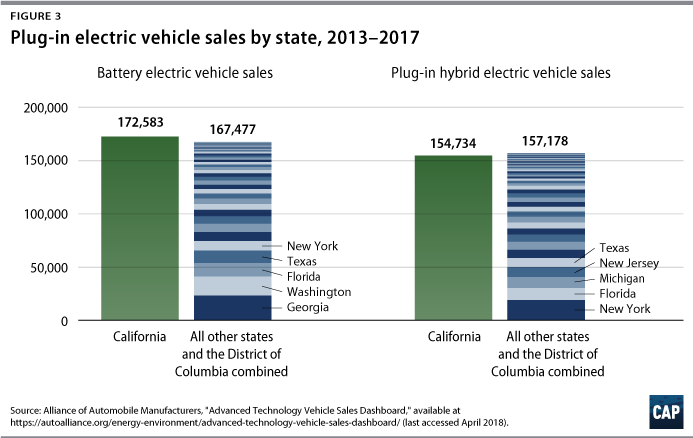 (see Figure 3) New York, Georgia, Washington, Florida, and Texas follow California in terms of the number of PEVs sold between 2013 and 2017. Most of the top PEV-selling states added more BEVs than PHEVs during this time period, but New York had more PHEVs than BEVs. In terms of overall market share, California, Washington, Oregon, Hawaii, Georgia, and Vermont stand out. 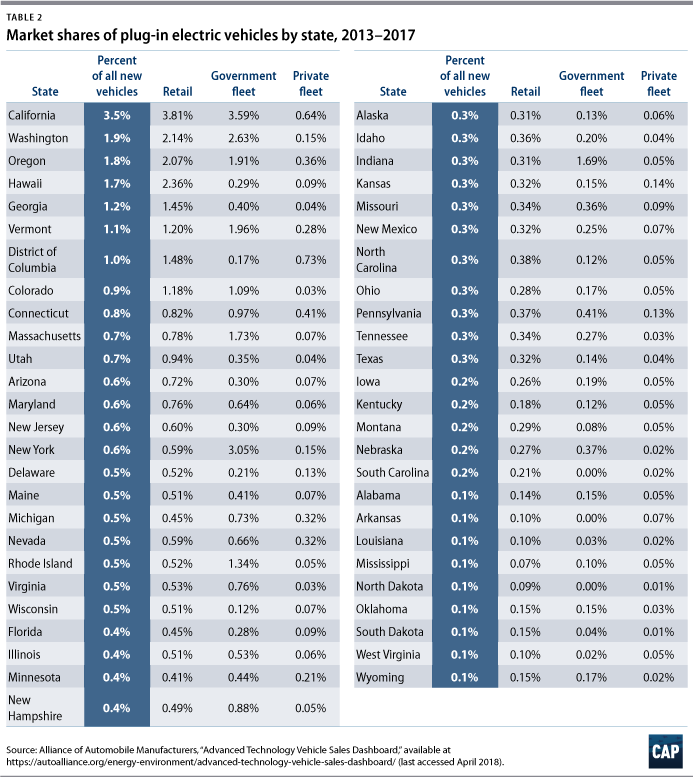 (see Table 2) California, Washington, and Georgia rank highly for both total sales and overall market share. Considering government fleet vehicles alone, New York, Indiana, Massachusetts, and Rhode Island boast far higher market shares than their respective market shares for all vehicles combined. In most states, retail market share tends to be higher than the market share for government or private fleets—such as rental cars, taxis, and corporate cars. California leads in terms of overall, retail, and government market shares but not private fleets. The District of Columbia just exceeds California in terms of private fleet market share. Across all states, the private fleet market share of PEVs was less than 0.75 percent and less than the overall PEV market share in that state. In a survey of drivers in California and nine Northeast states, consumers cited—in rank order—lower purchase price and being able to drive 200 miles on a fully charged battery as the top two attributes that would make them more likely to consider purchasing or leasing a PEV. For Northeast drivers, the third choice was greater selection of plug-in vehicle models; for California drivers, it was seeing more plug-in vehicle charging stations in parking lots and shopping destinations.25 As stated above, this report primarily focuses on barriers related to vehicles, but it also touches on charging infrastructure. Major automobile manufacturers have committed to deploying many more PEV models in the coming years. For example, Volvo has committed to producing five BEVs by 2021.37 General Motors plans to announce 20 new PEV or HEV models by 2023.38 And Ford is planning to release 16 new BEV models and 24 new PHEV or HEV models by 2022.39 BMW,40 Honda,41 Hyundai,42 Mazda,43 Mercedes-Benz,44 Toyota,45 Volkswagen/Audi,46 and Nissan47 have all committed in some form to investing in electric vehicles in the next decade. “Electric vehicles” do not have a standard definition. The term “electric vehicle” can encompass PEVs and HEVs, just PEVs, or just BEVs. It can even be misunderstood as simply HEVs. There are many different levels of electrification and charging infrastructure, all with similar names, which contributes to confusion; and industry and policymakers alike have done little to standardize the language. Charging infrastructure is a necessary companion to PEVs, and barriers to charging infrastructure deployment also inhibit vehicle deployment. Currently, charging infrastructure is mostly in metropolitan areas in the Northeast and on the West Coast.54 Unsurprisingly, this is similar to the vehicle market. Cost of infrastructure: The cost of deploying charging infrastructure can be extremely expensive. 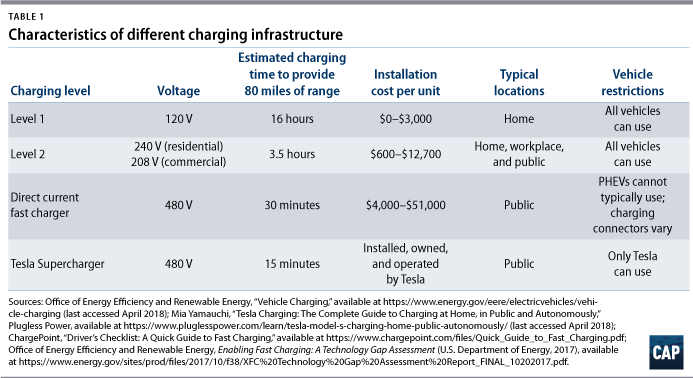 (see Table 1) Because of the high capital costs, it can be difficult to incentivize charging infrastructure to be built in underserved or disadvantaged communities. Cost of charging: Since current utility rate structures generally are not designed to account for PEV charging, prices vary widely by state, locality, and even charger. Utility investment: Utilities will need to be involved in charging infrastructure policy and, potentially, in deployment; yet current utility regulations could make it hard to generate utility investment. To justify the rate case for investments in charging infrastructure, for example, utilities may need to present complex cost-benefit analyses to regulators, which are complicated by uncertainty about market growth.57 Regulators must trust future benefits of investment that may not be obvious at the time– something they may be unlikely to do. 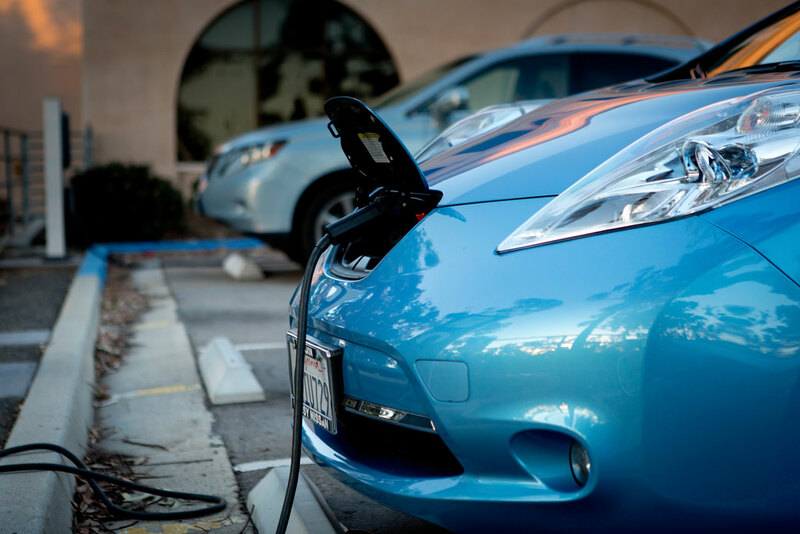 Solving charging infrastructure issues will require a set of dedicated policy solutions and must involve public utility commissions and municipal governments in addition to state governments. Other federal programs have helped to reduce the cost of batteries, make consumers more familiar with PEV technology, and deploy charging infrastructure. For example, the Department of Energy’s (DOE’s) Workplace Charging Challenge partnered with hundreds of employers who committed to providing employees with access to charging by 2018.67 The program familiarized people with PEVs and helped increase the number of charging stations; nearly 7,500 stations were planned or installed. Looking to other countries can also provide examples of policies that are effective at bolstering PEV sales. The following section surveys policies in Norway—the country with the largest PEV market share—and China, the country with the most total sales of PEVs and comparable market share to the United States. Norway continues to set ambitious goals for PEV deployment. By 2030, the current National Transport Plan calls for 100 percent of light-duty vehicles, 75 percent of long-distance buses, 50 percent of new trucks, and 100 percent of new heavy commercial vehicles to be zero-emission vehicles.73 With good consumer knowledge of PEV technology, incentives and subsidies in place, and a robust network of charging infrastructure, the country is likely to achieve its targets and further demonstrate the great potential for PEV deployment worldwide. States have broad latitude to influence PEV adoption through policy, and many states have developed a suite of innovative measures with varying success. The author of this report categorizes these policies and conducts a statistical analysis in order to determine, on average, which policies can effectively increase PEV market share in a state. California is a clear leader, and including the state in the analysis could maximize or minimize the effects of successful policies in other states. Tests were run with and without California included in order to provide a better sense of what policies are useful in the states trying to catch up. The following sections review in detail each state policy type listed above, explaining the key findings and policy design details and variations. Table 3, which includes California, and Table 4, which excludes it, present a summary of the policies tested, ranked by their ability to influence relevant market share. See Appendix A for a detailed study methodology and Appendix B for a list of state policies by type. Financial incentives for charging infrastructure in the form of rebates, tax credits, and grants are effective at increasing PEV market share. Although this report focuses on policies targeted at vehicles, given the importance of charging infrastructure to PEV deployment, the author also tested the impact of financial incentives for charging infrastructure in the form of government-funded grants, tax credits, or rebates. (see Appendix B) When California is included, charging infrastructure incentives provide the strongest link to the observed share of PEVs in a given state. These incentives are still important when California is excluded, though not to the same degree. Notably, in states with incentives, there are significantly higher levels of Level 2 and DC fast chargers per capita. (see Appendix B) A basic regression analysis linking charging infrastructure per capita to PEV market share shows that per capita charging can only explain about half of observed market share, regardless of whether California is included. These results indicate that financial incentives are effective at increasing PEV market share and the amount of charging infrastructure per capita, though increasing charging infrastructure is far from the only driver of vehicle sales. 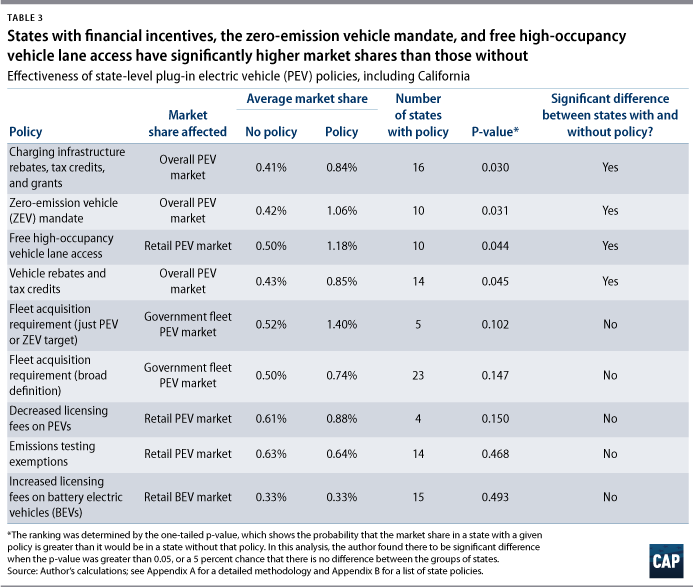 It is somewhat surprising that financial incentives for charging infrastructure were generally better predictors of market share than policies focused on vehicles specifically. 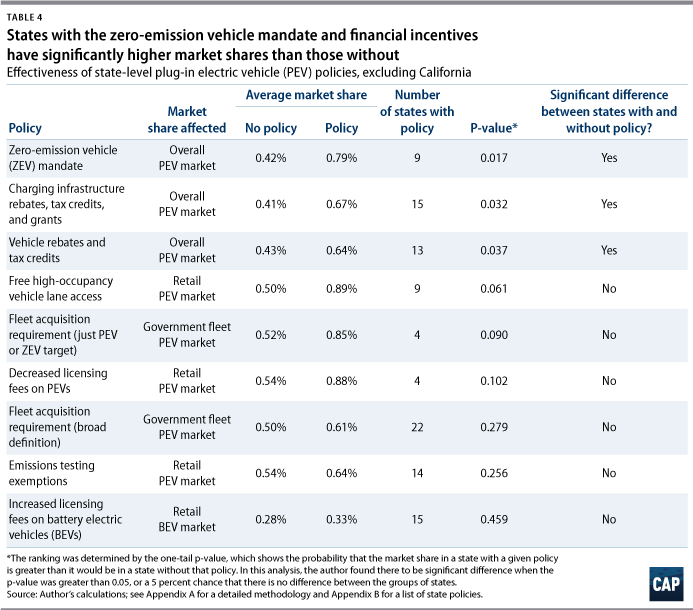 Financial incentives for PEVs in the form of rebates and tax credits are effective at increasing PEV market share, regardless of whether California is included in the analysis. This finding is consistent with many published studies.81 Other studies have also shown that financial purchase incentives alone may not be sufficient to promote sales.82 This analysis shows that financial incentives alone are linked to significantly higher market shares of PEVs, though each of the states with tax credits or rebates has enacted a variety of other laws that could help bolster its PEV market as well. 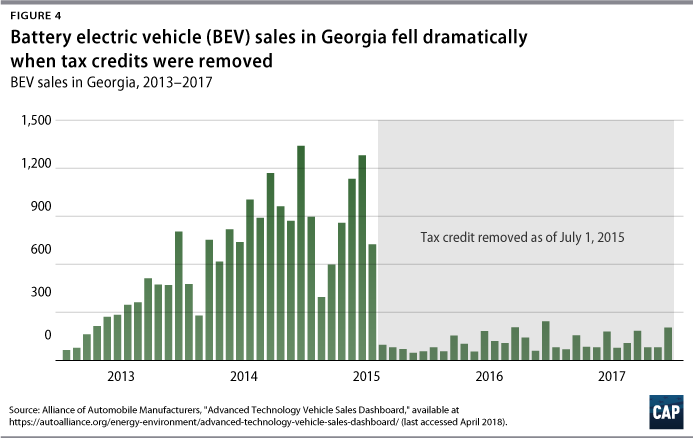 Although simply having a rebate or tax credit appears to explain PEV market share differences among states, the design of vehicle-based financial incentives is still important. Experts suggest that the most effective incentives would be applied at the point of sale and would promote the purchase of PEVs with high electric ranges over those with low ranges.83 Colorado, New York, and Vermont provide a tax credit that can be administered at the point of sale, which allows dealers to effectively lower the sticker price of vehicles. And several states have set variable incentives based on the battery capacity of a vehicle in order to more accurately reflect its environmental benefits. (see Appendix B) PHEVs that can run on gasoline have higher emissions—as do BEVs with shorter ranges that need to be recharged frequently. The ZEV mandate states had significantly higher market shares of PEVs than non-ZEV-mandate states, collectively reaching 3.65 percent of new vehicle sales in December 2017.89 On average, these states have enacted more policies to promote PEV deployment than non-ZEV mandate states, both in total and of the vehicle-specific ones considered in this report. When excluding California, the ZEV mandate is the best policy for increasing market share in a given state. Furthermore, adoption of the ZEV mandate could influence regional PEV markets, not just the market within a given state. The average market share of PEVs in ZEV mandate states was 1.06 percent; in states neighboring ZEV states (see Appendix B), the average market share was 0.62 percent; and in all other states, the average market share was 0.35 percent. This relationship is correlational, and other factors—such as charging infrastructure availability and local policies—could drive this trend. Even though the ZEV mandate is extremely effective at increasing PEV deployment in ZEV states outside California, the benefits are not yet fully realized across the 10 states. If the ZEV mandate states were to meet the 15 percent target by 2025, increasing their respective market shares by the same amount each year, the states should collectively be at about 6.8 percent now. The effect of the ZEV mandate has been reduced outside California because of the so-called travel provision in the ZEV rules, which stipulates that carmakers can earn ZEV credits in every state for a zero-emission vehicle that is sold in any ZEV mandate state.90 The provision has created an incentive to sell BEVs and FCEVs mostly in California, since that is where charging infrastructure and demand have been.91 Therefore, model availability varies widely by state. The Union of Concerned Scientists estimated that, in 2015, California drivers had 22 PEV model options, while no other state had more than 14.92 Six states—all non-ZEV mandate states—had none.93 Starting with the model year 2018, the travel provision was lifted for PEVs.94 Therefore, ZEV mandate states outside California are likely to soon see an increase in model availability and total PEV sales. On average, fleet acquisition requirements are not effective at increasing government PEV market share. This report considers states that had a specific target for PEV or ZEV acquisition and/or an alternative fuel or clean fuel vehicle requirement or specific target. All definitions of alternative or clean fuel include electricity, but they also typically include natural gas, biofuel, and others. The author only looked at the five states that had a specific target for PEV or ZEV acquisition. (see Appendix B) Broad fleet acquisition requirements that apply to all alternative fuel or clean fuel vehicles are not generally effective at moving the needle on government PEV market share. State fleet vehicles make up a tiny fraction of all vehicles, but states have far greater control over these than they do private vehicles. In 2016, the Federal Highway Administration reported that there were about 1.4 million state-, county-, and municipal-owned automobiles.104 California had the largest fleet with 231,692 automobiles. Of California’s new government fleet registrations in 2016, just 566—or 3.92 percent—were PEVs.105 Millions of cars are sold in the United States every month. Government fleet vehicles are unlikely to drive an electric vehicle revolution, but they still play an important role in reducing pollution and greenhouse gas emissions and in maximizing the use of taxpayer funds. Increasing licensing fees on BEVs does not decrease retail market share of BEVs, and decreasing licensing fees on PEVs does not increase retail market share of PEVs. The Highway Trust Fund supports infrastructure investment for highway projects. It is designed to be a user-supported fund, charging federal gasoline taxes and truck user fees that are then allocated to states via a formula. Beginning in the fiscal year 2008—and in each subsequent fiscal year to date—the Highway Trust Fund’s outlays have exceeded its revenues.106 Some of this decline is due to improving fuel economy and increasing market share of electric vehicles, which use alternative energy sources not captured by the gasoline taxes. Many states have adopted licensing fees for HEVs and PEVs to pay for their shares of infrastructure funds. Other states have further decreased licensing fees in an attempt to make PEVs more attractive to consumers. This report tests two questions related to licensing fees: One, does increasing licensing fees on BEVs affect retail market share of BEVs? Two, does decreasing licensing fees affect retail market share of PEVs? Between 2013 and 2017, 15 states charged consumers licensing fees for PEVs; other states have planned future fee increases.107 Many of these 15 states set different prices for PHEVs and BEVs in order to reflect a vehicle’s level of gasoline consumption. Since all states levy fees on BEVs but not necessarily on PHEVs, the report only looks at the effect of higher fees on the retail BEV market. The licensing fees range from $50 in Wyoming to $200 in West Virginia and Georgia. (see Appendix B) There is no appreciable difference in retail BEV market share between states that charge licensing fees and those that do not. Four states incentivize PEVs by removing licensing fees. The value of this benefit is $18 to $36 per year. (see Appendix B) The analysis found no evidence that this policy is effective in driving PEV adoption in these states. The four states had slightly higher market shares, on average, than the 47 states without such a policy, but the difference was not significant. Furthermore, the sample is likely too low to accurately measure the impacts of this strategy. Eliminating emissions testing fees for PEVs does little to increase PEV market share. Fourteen states offer emissions testing exemptions for PEVs. On average, across these states, emissions testing costs about $20, and in half the states, testing is only required in certain counties. (see Appendix B) Given the emissions benefits of PEVs, this policy makes sense, though it appears to do little to shift PEV sales. There are no standard or consistent policies across states aimed at closing the knowledge gap regarding PEVs or EVs more broadly. The DOE’s Clean Cities program has awarded millions of dollars for projects across the country that reduce petroleum use in transportation, some of which have gone to states.108 The program has helped nonprofits, academic institutions, and states fund pilot programs for increasing consumer awareness of PEVs. The Florida Department of Agriculture and Consumer Services, for example, received $400,000—which was matched by local funds—to allow thousands of visitors from across the United States to rent a PEV in Orlando.109 Colorado took the DOE funds one step further and institutionalized a program that the state tested through Clean Cities. Colorado’s state-run Refuel Colorado provides a set of technicians and coaches that work with fleets, communities, fuel providers, dealerships, advocacy groups, and others to help identify the monetary savings and other benefits of electric vehicles.110 The program also hosts ride-and-drive events to help familiarize consumers with EVs. The International Council on Clean Transportation (ICCT) found that, at the local level, promotional activities can be effective at increasing PEV market share. It documented that, in 2015, 22 of the 50 largest metropolitan areas had PEV informational materials and 30 had held city outreach events.112 Furthermore, PHEV market share was statistically correlated with combined city, state, and utility promotional activities in the metropolitan areas tested.113 Given the lack of statewide applicability and consistency among state-level policies for increasing consumer awareness, the author of this report did not empirically test the effectiveness of such policies. However, given the proven success at the local level, policies like this could be effective at increasing PEV market share and should be studied further as new policies are tested. The public benefits of electric vehicles are clear; they have been proven to improve air quality and reduce greenhouse gas emissions. Yet plug-in electric vehicles currently comprise approximately just 1 percent of new vehicle registrations, which translates to an even smaller proportion of total vehicles on the road.114 The market is not yet large enough to see benefits on the scale necessary to solve key environmental and public health challenges, such as reducing U.S. transportation emissions. Policy can help address issues that currently inhibit PEV deployment, such as cost, range, model availability, and knowledge of PEVs. Federal-level policies and initiatives have laid the foundation for strong action. These include tax credits; the DOE’s Clean Cities program and Workplace Charging Challenge; and investment in research and development. Norway and China have demonstrated that strong leadership and action at the national level is needed for an economywide change. Particularly effective are policies that lower the cost of PEVs below their ICE vehicle competitors in order to reflect the environmental benefits of electric vehicles. As states take an increasing leadership role in the PEV policy space, they should consider what policies and combinations of policies are effective at putting more PEVs on their roads. Building on this analysis, a future report will provide recommendations for increasing state-level ambition for PEV policy action. This analysis was similar in design to Sydney Vergis and Belinda Chen’s study on state-level policies and general trends as well as Nic Lutsey, Peter Slowik, and Lingzhi Jin’s report on local-level policies.118 Policies were measured using two-sample, one-tailed t-tests, which assumed unequal variances, in order to compare the relevant market shares of groups of states with and without the policy in question. Market shares used were for all vehicles, government fleet vehicles, and retail vehicle sales. Depending on whether the policy would be relevant to that market, different market share segments were used. For example, a government fleet vehicle requirement would not necessarily influence the overall market but could affect the share of government vehicles. Importantly, the date of policy introduction is not considered in this analysis; states were considered to have a policy if there was a policy in effect at any point during the study period of 2013 to 2017. The author ranked policies’ effectiveness by the p-value from the t-test, which shows the probability that market share in a state with a given policy is greater than in a state without that policy. This analysis found there to be a significant difference when the one-tailed p-value was greater than 0.05. Market share data are from the Alliance of Automobile Manufacturers and reflect new vehicle registrations in each state from 2013 to 2017.119 For each test, the state policies are detailed in Appendix B. The author considered states with financial incentives in the form of government-funded grants, tax credits, or rebates that can be used for public or private charging infrastructure. Other financial benefits are available in these states and in others, though funding is less direct or the state has less control. Nebraska, Ohio, Oregon, and Utah, for example, all offer loans for charging infrastructure. Many utilities offer charging infrastructure incentives specific to their service areas. Arizona, the District of Columbia, Delaware, Idaho, New Hampshire, Nevada, Pennsylvania, Virginia, Washington, and West Virginia neighbor ZEV mandate states. Arizona, California, Florida, Georgia, Hawaii, Maryland, North Carolina, Nevada, Tennessee, and Utah allow—or allowed during the study period—free access to PEVs on all HOV lanes in the state. Lia Cattaneo is a research associate for Energy and Environment Policy at the Center for American Progress. The author would like to thank Luke Bassett, Alison Cassady, Kristina Costa, Patrick Dolan, Michael Madowitz, and Danielle Schultz for their contributions. This report was also improved with input from many partners in federal, state, and local governments, as well as others in the public and private sectors.